Sarah Combes is co-presenter of Difficult Listening, Sundays, 9-11pm, RTRFM 92.1, Public Radio, Perth. Robbe-Grillet is considered one of the most innovative novelists of the 20th century, challenging conventional narrative modes and abolishing fictional elements such as character, plot and chronological time in favour of repetition and absence of emotion. His novel Djin is inherently subjective, lacking any one specific point of view. Time expands and contracts within this changeling tale, exploring themes surrounding the dislocation and disorientation of the self, identity loss, multiple personalities and recovered memory. As the audience is encouraged to grapple with these relatively complex ideas explored through an almost impenetrable plot, it gradually becomes apparent that in the Lindsay Vickery opera Rendez-vous, based on Djin, and its characters refuse to yield their secrets readily. Fragments of the plot are gradually revealed through comical stories and far-fetched tales of intrigue and strange occurrences. As the stories become wilder, the audience grows suspicious, not only of the characters (especially those who relish a good lying competition) but of the synthetic and deceptive nature of the narrative itself. It is left to the audience to piece this puzzle together and construct their own version of the plot, potentially changing their role as passive consumers to producers of meaning. While it is sometimes difficult to keep up with the twists and turns of this tightly woven story, one can’t help but feel part of an elaborate mystery. After all, apart from the monochromatic darkness, paranoia and romantic pessimism, the first thing one expects from homage to film noir is taut, if tortuous, plotting and Rendez-vous certainly delivers! Led by a fine, burly-toned saxophone and languorous cello, the prologue sets the scene as a foreboding male voice resonates through the hall. An uneasy yet fascinated audience begin their journey into an intriguing Parisian underworld guided by the crooked characters that dwell in its seedy ambience, shadowed by an industrial horizon. Anticipation builds as the prologue ends with a sense of melodrama from piano accordion and violin, gradually moving into some interesting percussion work. The sound of a dripping tap echoed by slow chromatic scales performed on piano cuts icily through the still and intense atmosphere. The expressive power of the common chromatic is made evident in this mesmerising sequence. One feels almost afraid to breathe. The range of vocal styles explored (from naturalistic dialogue and heightened speaking, to unaffected singing and finally to full operatic delivery) helps translate the text by placing emphasis on specific phrases of the dialogue. As the pace and depth of expression change erratically, the audience is less likely to de-focus. In an impressive display of range and flexibility, all 3 performers switch seamlessly from one vocal technique to another. This is in part due to Vickery’s skills as a librettist. His adaptation of Robbe-Grillet’s novel proves that subtext, ambiguity and the limitations of language can be effectively explored in musical theatre. Dressed to kill in the archetypal noir dress code of trench coat and trilby, beneath a furrowed brow and through his resounding baritone, Andrew Broadbent gives a brooding, charismatic performance as Simone Lecoeur. Simone, also known as Boris, the bewildered schizophrenic anti-hero, is an iceman melting as the structure of his world begins to disintegrate. Kathryn McCusker plays the mysterious and alluring Djin with dramatic intensity, balancing a lyrical tenderness with mild robustness to great effect. Finally, Taryn Fiebig in a striking performance, captures the chameleon-like character of Marie to perfection. Her voice and personality range from hilarious, spritely wild child to enchanting, cabaret songstress. 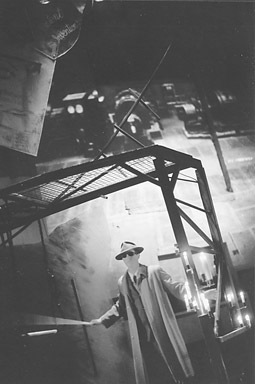 The virtual set was constructed by Vikki Wilson and Rick Mason of Retarded Eye. Taryn Fiebig, Borivoje Kandic, Jett Black and Maxwell Vickery were photographed in gritty, black and white footage intimating European history and French noir, adding another dimension to Rendez-vous’ surrealist world. Through what appears to be a blend of archival and original footage, Retarded Eye’s creation is bewitching and bizarre, filling the hall with its haunting ambience. B-grade sci-fi images and fairground ferris wheels add to the cold and intense images of industrial machinery, typewriters, deserted alleyways and cryptic photographs. This virtual world blends well with Duncan Ord’s lighting which, in keeping with the style of film noir, creates a strikingly sharp contrast between light and shadows. Lawrie Cullen-Tait’s set and costume design melds elements from different genres and plays with the duality between new and old, drab and colourful, real and surreal. The industrial scaffolding ablaze with dripping candles is a striking centre piece, reminiscent of David Lynch and Angelo Badalamenti’s Industrial Symphony. The single projection gives a clear sense of the world being explored, however, to be fully submerged in this dark fantasy does still require a stretch of the imagination. Several screens (smaller if need be) could be erected to create an extra dimension to the work. Director Talya Masel plays quite freely with the allusions and illusions of the theatrical/filmic medium with humour and a literate imagination. Rendez-vous is a gripping theatrical experience. Vickery’s creation is a unique and intrepid fusion of artforms and genres supported by his cutting edge musical score.